But the discussion last month launched dozens of doctors into a broader emotional debate over end-of-life decisions for their patients. One doctor invoked the “death with dignity” message of South African Nobel Peace Prize laureate Desmond Tutu, while another cited the “do no harm” mantra of the Greek physician Hippocrates. 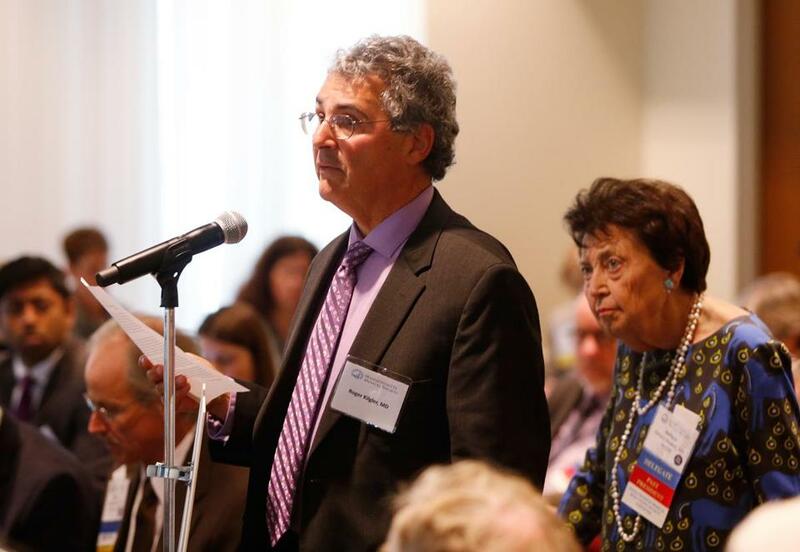 In the end, the policy-making body decisively endorsed the survey and approved $25,000 to fund it — a sign that the Massachusetts Medical Society may be reconsidering its historic rejection of what it has called “physician-assisted suicide.’’ It comes as this movement to give terminally ill patients an option to end their life at a time of their choosing is gaining traction, propelled in part by some physicians’ groups dropping their longstanding opposition. The debate — in a hearing room packed with 200 delegates — revealed deep divisions and perhaps hints of change. The doctors even disagreed about what words to use to describe the movement. Supporters preferred to call it “medical aid in dying” and emphasized the protracted suffering of terminally ill patients. But critics prefer the term “physician-assisted suicide,” and they emphasized that doctors are entering a slippery slope if they are allowed to prescribe fatal drugs to hasten a patient’s death. Speaking in favor of the survey, one physician warned that many in this profession, particularly older doctors, may be out of step with an end-of-life movement that is attracting widespread public support in many parts of the country. “A lot of us — whether we want to admit it or not — are afraid of death,” a Wareham doctor said at the hearing. The Massachusetts Medical Society has never before surveyed its 25,000 physicians and medical students about end-of-life options, which are now legally available in six states — Oregon, Washington, Vermont, Montana, California, and Colorado — and appear on the brink of final city enactment in Washington, D.C. And the medical society also approved funding for the poll at a level that was more than double what was originally requested. Dr. Roger Kligler, who spoke at the medical society’s hearing last month, filed a state lawsuit in October, arguing he has a constitutional right to obtain a lethal dose of medicine, if he is deemed by a doctor to have less than six months to live, and choose when he dies to avoid needless suffering. The suit is expected to be heard in court this year. Kligler — and other physicians who share his view — face a lengthy history of opposition inside the state’s medical establishment. Since 1996, the Massachusetts Medical Society’s top delegates have voted to oppose what it called “physician-assisted suicide,” and in 2012 it joined the Catholic Church and some disability groups in lobbying against a “death with dignity” ballot initiative in Massachusetts. Voters narrowly defeated the initiative, despite early polls indicating that the public favored it. Medical society officials in Massachusetts have also lobbied against proposed state legislation on the issue. But in recent years some physicians’ organizations in other states have begun to drop their opposition, in a prelude to legalization of the option in their states, said Sean Crowley, spokesman for Compassion & Choices, a nonprofit dedicated to passage of such measures nationwide. In May 2015, the California Medical Association became the first state medical organization to change its historic opposition, voting to become “neutral” to its state’s end-of-life bill. That legislation passed and went into effect last year. The Colorado Medical Society also took a neutral position on the issue last year, which played a major role in the passage of a ballot initiative in November, Crowley said. A national survey on ethics last fall by Medscape, a major online medical news outlet, also shows rising support among physicians. Among 7,500 physicians who responded, 57 percent believed an end-of-life option should be available to terminally ill patients, up from 54 percent in 2014 and 46 percent in 2010. Meanwhile, some state doctors’ groups are awaiting a report this year on the topic due from the American Medical Association, the largest national physicians’ group. Given the soon-to-be-released national report, Dr. Barbara Rockett, who has twice served as president of the Massachusetts Medical Society and long opposed the end-of-life option, urged her colleagues last month to table the survey until the national group’s report is completed. She said she saw the vote over the survey as the “well-orchestrated” political work of a small group of doctors trying to reignite this issue in Massachusetts. She also said she disapproves of the term “medical aid in dying,” which she thinks attempts to neutralize the profound ethical issues for doctors. “Let’s call it what it is — physician-assisted suicide,” she said. But supporters of this option say “suicide” is an emotionally loaded — and inaccurate — term because terminally ill patients who seek this alternative are not suicidal, but want to live. In states with such laws, they say, many safeguards are in place. Doctors in these states are authorized to prescribe a lethal dose of medications to patients who are deemed by clinicians to have less than six months to live and are mentally sound, according to Crowley. The drugs must be self-administered by the patient. Some physicians acknowledged, after the meeting, that current medical practice has an ethical gray zone, one in which doctors administer high doses of painkillers to lessen a patient’s acute pain, which they know will likely hasten death due to the medications’ effect on the lungs and other organs. Ruby said that scenario, however, is not the same as giving terminally ill patients control over when and how they die. Meanwhile, Dr. Mary Louise Ashur, an internal medicine doctor in Needham who spoke largely against the resolution, said advances in palliative care must be front and center in this debate, and this reflects the medical community’s ongoing compassion toward the dying. She said most terminally ill patients are not writhing in pain as they die. “For most people, death comes peacefully,” she said. The specific questions in the poll — and who will oversee it and how it will be unrolled — have yet to be finalized, said society spokesman Rick Gulla. Meanwhile, both sides are staying in close touch with the medical society to hear details of the survey. Patricia Wen can be reached at patricia.wen@globe.com. Follow her on Twitter @GlobePatty.